Wedding photography is such physically demanding work, so shooting with the Sony α7 mirrorless system definitely helps me not to feel like I’ve been hit by a train after a long day. 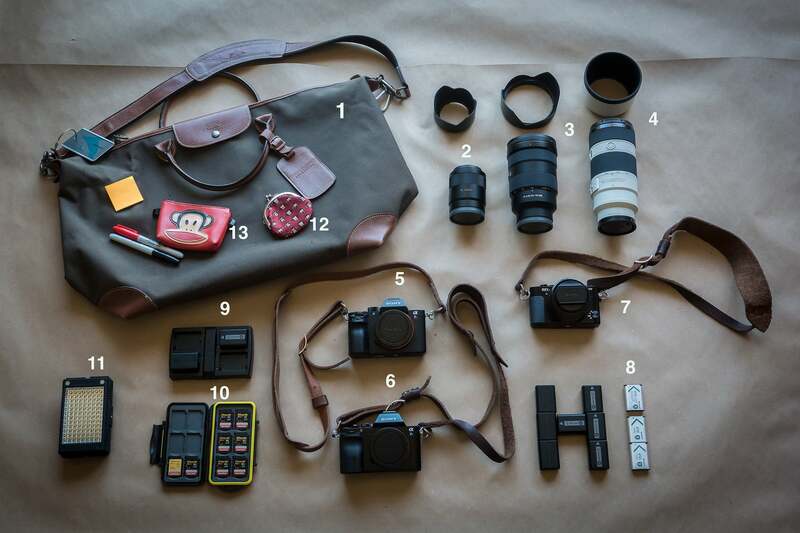 Here is the list of gear that I mostly use for my wedding assignments. 1. Longchamp Paris Boxford Travel Bag is my companion for wedding day photography for local or destination gigs. This is not a typical camera bag, but I really like the style of the bag, especially the thick canvas material and the leather wrapped corners. To protect the camera & lens, I built my own partitions with padded inserts that I found on Amazon. 3. Sony FE 24-70mm F2.8 GM Lens. This lens has become my workhorse lens for ceremony, reception or group shots. At 24mm, it covers wide shots of the bride & groom walking down the aisle (which I like for getting photos that show the audience' eyes on them) and I use it at 70mm and f/2.8 for shooting close up portraits the with creamy bokeh. I probably shoot a good 60% of the entire wedding with this lens. 4. Sony FE 70-200mm F/4 G OSS Lens. This is my long lens for shooting the ceremony or reception at a larger venue. The lens isn’t very heavy at all, it focus fast (which is necessary for the ceremony) and it has great clarity. I use this lens a lot for capturing close-ups of the bride & groom during their first dance, as well as father-daughter dance, and groomsmen and bridesmaid speeches to catch reactions. 5. Sony α7R II. I mount the 24-70mm F2.8 GM lens on this camera as my workhorse combination. It has massively-fast AF which is necessary for shooting in the fast-paced environment of a wedding ceremony. The 42MP file size makes our team of retouchers happy. Sometimes if I don't have time to set up lighting during the reception and I have to dial down the shutter speed, the α7R II’s in-body stabilization allows me to shoot 1/60-sec. or 1/40-sec. handheld. 6. Sony α7S. I mount the 70-200mm F/4 G OSS lens on this camera during the reception from cocktail hour until the end of the event. With the α7S, I can shoot at ISO 5000 to 10,000 and still get acceptable images for my retouching team. Even with just ambient lighting the photos look good when I’m shooting higher ISO settings during the reception. 7. Sony RX1R II. The RX1R II is quite handy if I have to shoot in a very low-light reception hall. The camera gives me sharp images, the f/2 aperture works great in low light, and its super-compact so it‘s less weight on my shoulder! I like to shoot from a more eye-level perspective and the camera gives a street-photography, candid feel to the photos of the wedding guests taken during the reception. I just use my feet for zooming. I also use this camera’s macro mode to shoot close ups of details such as the rings, invitations and other small items. 8. Extra batteries for the α7R II, α7S and RX1R II. 10. 95MB/S 32GB & 64GB memory cards. 11. Video light for shooting wedding details such as shoes, rings, invitations, center pieces, the cake and party favors. 12. Small pouch for filled up SD cards. I need to keep my things organized in the midst of chaos! 13. Paul Frank Monkey Pouch for out of juice batteries. From Paris to Shanghai, Zabrina has travelled the world as a wedding and engagement photographer. As a WPPI Master Photographer and processor for over 60 international award-winning photos, she has accumulated six first place winner and two International Image of the Year awards from WPPI since 2011. Zabrina was named one of the Top 50 World's Best Destination Wedding photographers from Junebug Weddings and one of the 30 Rising Stars by Rangefinder Magazine. Her work has also been published in International Master Photographer, Vanity Fair (USA), Grace Ormonde Wedding Style, Town & Country (Thailand), Cosmopolitan Bride (China), ELLE (Hong Kong), Stuff Magazine (UK) and Vogue Italia's PhotoVogue. Zabrina also photographed the Grammy Award winning R&B band All-4-One for their 20th anniversary album cover using a Sony mirrorless camera. Besides her shooting assignments, Zabrina is also a popular speaker for major photographic conferences across America & Asia, training professional photographers on how to take their craft to the next level.